Rick James, Harbour Publishing Co. Ltd. The west coast of British Columbia from Victoria to Prince Rupert, nearly 500 nautical miles, is described by Rick James in West Coast Wrecks as “one of the most treacherous stretches of coastline anywhere on the planet.” He should know, having researched in detail 20 wrecks based on newspaper articles of the day and photos of ships and crew that perished in this watery graveyard. Most of the wrecks were a result of violent storms, heavy seas, and submerged reefs that are frequent in this area. The earliest wreck reported occurred in 1869 when the 113-foot sailing vessel, Maria J. Smith, was abandoned by her captain and crew during a gale when dangerously close to a lee shore. To their amazement, after being picked up by a passing ship, the wind shifted and the ship sailed away from danger into the open ocean off Cape Flattery, Washington. After wandering as a phantom ship for two months, she ran aground and foundered off Aristazabal Island near Bella Bella, BC, some 400 miles north … a remarkable final voyage indeed! Most of the ships chronicled did not have such a spirited adventure before their tragic endings … they simply foundered in heavy seas or ran aground with great loss of life. One of the worst maritime disasters in the Pacific Northwest occurred in 1918 when coastal steamer Princess Sophia ran aground during a gale and slid into the depths taking all 343 souls aboard with her. Recreational boaters who read these accounts of good ships going to the bottom should reflect on the importance of humility and seamanship. Every sailor and every vessel, no matter how sound, is vulnerable when dealing with the wrath of Mother Nature. But take heed, proper preparation and nautical knowledge will go a long way towards ensuring a safe voyage: always know the weather forecast, always know your position, and always know the closest safe refuge along your route. And never ever abandoned a sea-worthy vessel until you absolutely have to … it often survives as the sole witness to a self-rescue effort. In addition to documenting wrecks, James’ stories span 140 years of BC’s maritime history, including how Wreck Beach in Vancouver got its name; how retired ships were used as breakwaters, five of which are still in use today; how majestic sailing vessels that outlived their usefulness were converted into all too ordinary coal or log barges; how Chinese Junks created a sensation when they arrived on the west coast in the 20’s and 30’s; and how Fred Rogers, “Wreck Diver Emeritus,” explored BC’s wrecks and accumulated enough data to fill three books. 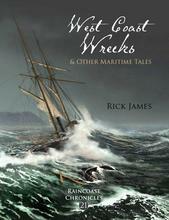 If West Coast Wrecks piqued your interest, you might consider one of Rogers’ books as your next read.